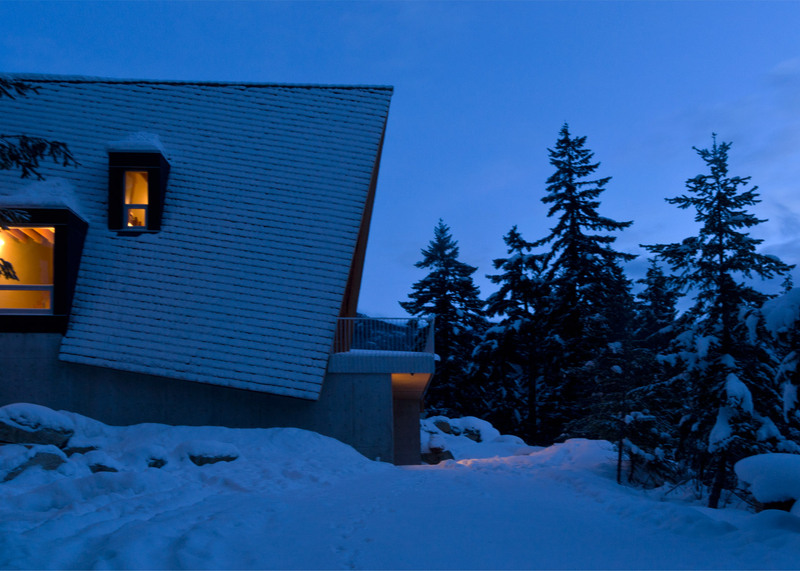 The A-frame exterior of this mountainside cabin in Whistler was designed by Canadian studio Scott and Scott to mimic neighbouring 1970s chalets. "The neighbourhood is made up of similar sized A-frame and Gothic arch cabins and chalets," said the architects. "In contrast to the more recent larger-scaled residences in the region, the cabin was designed around the owners and our desire to work with the original scale of the early structures in the area." In order to blend in with the neighbouring residences, the architects designed an A-frame structure topped with a wooden shingle roof. "The lumber joinery has been designed and engineered to utilise a simple repeated lapped joint at the floor and roof connections," said the architects. "The lap is reversed outward to allow for window dormers at the stair, bunk room and kitchen." The cabin is entered from its lowest level, which contains a room for drying kit, space to store equipment, a washroom and a laundry. Upstairs, the living area and kitchen backs into the hill. A completely-glazed facade allows a clear view of the mountains, valley and nearby Green Lake. A bedroom, a "bunk room" and a guest room are located on the top floor of the property. While the main bedroom benefits from the expansive outward views, the guest room provides access to a private terrace nestled into the rock behind the cabin. "The materials are locally harvested and quarried," explained the architects. "The exterior is clad in red cedar shakes, which will weather to the tone of the surrounding rock, the interior cabinetry was site-built by the carpenters with construction grade rotary-cut plywood, and the counters were fabricated from marble from the Hisnet Inlet quarry located on Vancouver Island." Scott & Scott frequently uses locally sourced materials for its projects. When updating a Canadian mountain house, the studio similarly created marble counters from a block milled at the Hisnet Inlet quarry, which is near the founders' own cabin. Scott & Scott was set up at the start of 2013 by husband and wife David and Susan Scott. Since then, the duo have also designed the interior of a pan-Asian restaurant in Vancouver and a currywurst restaurant featuring peg holes on the walls.